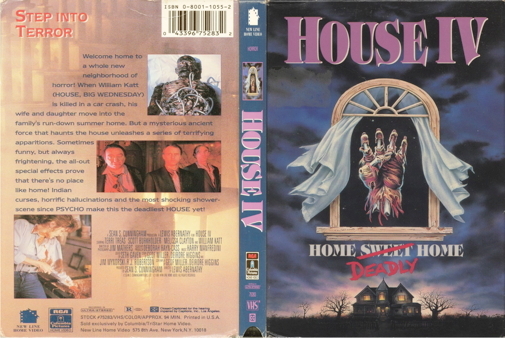 After two unsuccessful attempts to turn the House horror franchise into a collection of unrelated haunted-house stories (even ditching the House moniker prior to distribution of the third film, The Horror Show), the producers opted for a direct sequel (more or less) to the first film in the series. William Katt returns briefly for the role of Roger Cobb, the former beleaguered owner of a nightmarish fixer-upper filled to the brim with obnoxious demons. His part here amounts to little more than a cameo -- early in the film, Roger is killed in a nasty auto accident during a vacation with his new wife, Kelly (Terri Treas), and their 12-year-old daughter, Laurel (Melissa Clayton). Kelly and Laurel -- who is now confined to a wheelchair -- try to begin their lives again at the family's summer house. Once there, Kelly is visited by visions of horrific events (including Roger's death) that become more frequent until she is forced to seek the aid of a shaman, who helps her to interpret them. The visions include a replay of the events that led to Roger's death, indicating that the crash was no accident -- and revealing the identity of the party responsible.